Rabbits are plentiful, sustainable, cheap and healthy*. Cooked badly, they’re about as appetising as an old boot. I’ve found that farmed rabbits can be successfully roasted with lemon, rosemary and garlic, but try the same treatment with a lean, muscular wild rabbit and the dish generally ends up in the bin. On the other hand, cook a wild rabbit in a slow cooker with tomato, wine, garlic and onions, and you’ll end up with tender meat and a pasta sauce to end all pasta sauces. Farmed rabbits tend to be plumper and softer, the flesh not as exercised as their wild brethren. Try to find out which sort you’re buying and keep that in mind when you’re deciding what to do with it. This method is simplicity itself, and guarantees the most tender rabbit possible. Lay the leg and shoulder joints from two rabbits out in a single layer in a casserole dish and salt with a couple of tablespoons of sea salt. Cover and refrigerate for a few hours, up to six should be OK. When you’re ready to cook, quickly rinse the joints of excess salt and pat dry with a clean tea towel. Rinse out the casserole dish too, and return the rabbit to it. Add a handful of black peppercorns, a bay leaf and a good sliver of lemon peel to the dish and cover the rabbit with melted duck or goose fat. It’s always difficult to work out how much fat will be necessary – this time, I used three 300g jars. The meat should ideally be covered by the fat, but if it isn’t, don’t worry. Just turn the meat over a few times during the cooking process. Cover the dish with foil and put it in a low oven, 150c, for at least an hour and a half. If you’re using wild rabbits, they’ll take much longer, maybe another half an hour or forty minutes extra. The meat is ready when it’s meltingly tender when prodded with a knife. 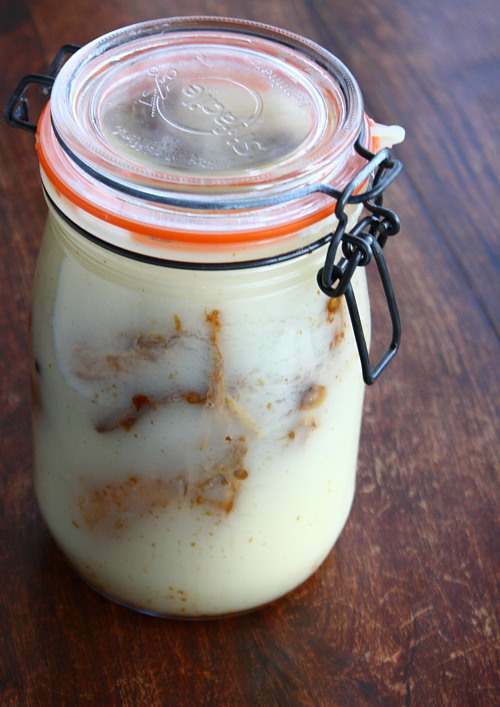 Using a pair of tongs, lift the cooked joints into a large, clean Kilner jar, tucking them in tightly. Pour the fat into the jar, making sure that it completely covers the meat. The fat will set, encasing and preserving the meat. When you want to eat some, just dig out a joint and flash it in the oven for ten minutes to crisp up. The rabbit will keep like this for weeks. It’s tender to the point of collapse, salty and bursting with flavour. This recipe is from Tom Norrington-Davis and Trish Hilferty’s superb Game: A Cookbook. * Rabbit meat is healthy. Duck or goose fat, with salt, is not. Beware. This is not everyday food. Lovely – I only get a chance to have rabbit at restaurants who periodically serve it. I think a few local butchers have it at certain times of the year, but for such a common garden visitor, it's considered exotic meat for many. Which is odd, since people eat hot dogs all the time and you can't get more mysterious than that! Great recipe, and blog…I cooked a lot of rabbit when I was working in France but I've never seen it for sale in NZ or Japan where I'm from (or the 8 months I lived in Yorkshire for that matter, but I *was* in Hull ;P). I wonder if I can find it here in Austria, will have to keep my eyes peeled. You lived in Hull? I'm really sorry. This sounds great, never thought about confiting rabbit. Theresa – $30! that's insane. These rabbits were £3 each. One of my favourite dishes as a child was rabbit stew with a mustard cream sauce, but it never occurred to me to try it as a confit. This is definitely going on the list of things I must try next time I want to make an impressive meal. looks and sounds amazing. I would love to try this! had 2 rabbits in freezer which my dog killed during big freeze. not mad on stew but love confit. it's cooking as i type. probably won't get round to letting you know but reckon it'll work. Very promising recipe. So i picked up a rabbit at P&C Market in Wash DC and three jars of duck fat. Just finished searing the rabbit and popped it into the bath of fat. Can't wait till it is done. Looks good! Rabbit was available at many butchers at the Bolton market for those of you in the north west and was around the £3/£4 mark. Must try a farmed one, only every had wild and it has always involved having a crunch on a shotgun pellet !